“I have been so incredibly fortunate always being in the right place at the right time. 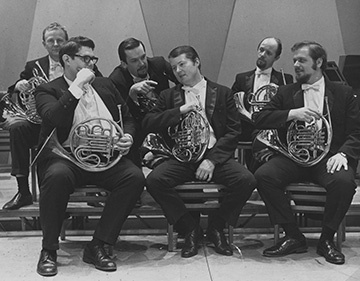 Arthur David Krehbiel, better known as Dave to his friends, was the principal horn of the San Francisco Symphony from 1972 until he retired in 1998. He played under Seiji Ozawa, Edo de Waart, Herbert Blomstedt and Michael Tilson Thomas. He currently resides in Reedley, CA near Fresno where he and his wife Carol grow grapes on their 45-acre vineyard. He was studying trumpet in the 8th grade when his parents took him to a concert of the Fresno State Orchestra. Instead of focusing on the trumpet player, he was mezmerized by the sound coming from hornist, Jim Winter. “I was overwhelmed by the sound of the horn. That is what attracted me to it.” It wasn’t long before he switched to the horn and started studying with Jim Winter. After three years in Fresno, Jim Winter encouraged him to go to Northwestern to study with Philip Farkas, the principal horn of the Chicago Symphony. The teacher and student hit it off, and Farkas wanted Krehbiel to be his assistant in the Chicago Symphony. It was a different era when musicians could just be appointed to the orchestra without auditioning. Farkas didn’t want the responsibility on his shoulders so he asked the conductor, Fritz Reiner, to listen to Krehbiel. “I went to his apartment and was very intimidated. I knew that if I missed one note it would be over. Reiner looked like Bela Lugosi [Dracula 1931] and in his scratchy voice said, ‘Play Heldenleben.’” Krehbiel attempted to play the first low note and it didn’t come out. It was a cold winter day and he hadn’t warmed up. At that point Krehbiel figured it was a lost cause so he achieved the perfect relaxed audition attitude. Farkas had just published his book The Art of French Horn Playing and an autographed copy was on Reiner’s table. ‘Your teacher gave me this book,’ he grumbled. ‘You must loosen the ‘arm-bore-shoore’ (embouchure) for the low notes.’ Krehbiel continued the audition and the second time the low Bb spoke. He was totally relaxed. “I realized afterwards that Reiner probably thought I took direction well. He told me what to do and I fixed it. So they called and offered me the assistant job. I was elated for two days before the terror struck me. I knew I had to get serious about the horn.” Up until then, he had good days and bad days. Farkas had said, ‘Don’t change a thing, kid. You won the job,’ but Krehbiel knew he would never survive if he didn’t learn to play consistently. Krehbiel learned early on how to lead by example. Other musicians will follow if they see the leader enjoying what they are doing. “You lead by who you are and how you play. You don’t need to tell anyone else what to do. That is a mistake a lot of people make.” Bud Herseth (Principal Trumpet 1948-2001) was that leader in the Chicago. Sitting three feet from his bell was something Krehbiel will never forget. He led the entire orchestra and everyone followed him. When Krehbiel worked for the Chicago Symphony he was making $145 per week. There were no guarantees and no committees. He had no way to plan his life because schedules were posted one week at a time and Management constantly changed them. “There has been such a change in the union in my lifetime. I have benefited greatly because of the union.” The members of the Chicago Symphony were responsible for starting Senza Sordino [ICSOM newsletter] and they were the first orchestra to have a committee. While in Chicago, Krehbiel got to play with great conductors like Leopold Stokowski, George Szell, and others. Playing at that level was easier than he expected. “There is so much confidence all around you and people play in tune; everything works. I wasn’t nervous at all.” Farkas left after Krehbiel’s second year and Krehbiel continued to play assistant for the next three years. In 1962, he was appointed co-principal with Frank Brough. “That worked out great for both of us. The orchestra manager told me that Conductor Fritz Reiner was very happy with the situation and we were going to be co-principals for the next season.” Later Krehbiel found out that a principal had already been engaged for the next year. He couldn’t believe the manager had lied to his face. This motivated him to find a principal job elsewhere. There were openings in Pittsburgh and Detroit at the time. He auditioned and won both jobs and chose to move to Detroit. Paul Hindemith conducted one of Krehbiel’s last concerts with the Chicago Symphony, a runout in Milwaukee. Traveling back by train gave Krehbiel the opportunity to seek out his idol to say a few last words to him. (This was a few months before Hindemith’s death.) “I had already signed my contract to go to Detroit but I was still burnt about the orchestra manager lying to me.” Krehbiel found Hindemith sitting at a table next to said manager. He wasn’t going to stop but Hindemith called him over. ‘What are your plans, young man?’ Krehbiel told him he was leaving the orchestra to play principal horn with the Detroit Symphony. Krehbiel dreamt of returning to California. He had grown up in a small town and wasn’t a city person. “The only reason I lived in big cities was to play in orchestras.” After 9 years in Detroit, his opportunity finally came when Bill Sabatini, principal horn of the San Francisco Symphony (SFS) stepped down. Times had changed and conductors could no longer hire musicians without an audition. Candidates had to play for an audition committee. It had been a long time since Krehbiel had taken an audition. Concurrently the Boston Symphony had a principal horn opening, so he decided it would be good practice to audition for both. In Boston he tied with Charles (Chuck) Kavalovski and the Boston Symphony asked them each to return and play a week before they chose a winner.